The crew of "The Rover Boys Express"
Hap gave this photo to Rick Feldmann. 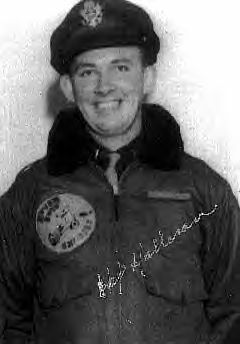 During WWII, I was the navigator of a B-29 bomber based out of the Island of Saipan in the Pacific Ocean. Our mission was to bomb targets on the Japanese mainland. These were very high altitude and long range missions of 14 to 16 hours duration. The average age of our eleven man crew was 21. I was 22. On January 27, 1945, our B-29 was shot down by a Japanese fighter plane over Tokyo at 32,000 feet. Fear and denial set in immediately among our crew, but realistically we all knew that we had to abandon our plane - it was on fire with two engines out. And as if that wasn't enough for us to worry about, the normally pressurized and heated interior of our plane had been ruptured and we were dealing with an outside air temperature of 58 degrees below zero at 32,000 feet. We would freeze solid if we didn't act fast. We had no choice but to attempt to parachute out of our disabled bomber, and to do so as fast as possible. As the order went out, "Bail out, Bail out" we were terror-stricken young men and boys, but somehow we maintained our composure. I prayed to God, for myself and for my fellow crewmen. We embraced each other quickly, then we jumped from our dying ship at 27,000 feet altitude and parachuted over enemy soil, just east of Tokyo. To avoid freezing or passing out from lack of oxygen at such a high altitude, I elected to free fall until I was approximately 3,000 feet above the ground, at which time I pulled my ripcord and thankfully my parachute blossomed above my head. I was immediately captured by a group comprised of very angry Japanese civilians and military personnel, who beat me so badly I thought I would be killed. It turned out I'd been one of the lucky ones, because some of my fellow crewmen were beaten to death that very same day. For what seemed like a very long time, I wavered between life and death. Subsequently I was forced to sign documents acknowledging that I'd been part of an indiscriminate bombing campaign which had killed civilians. I was also forced to sign a waver of my Geneva Conference Prisoner of War rights. I was not considered a POW by the Japanese, but instead a Federal Prisoner. I was charged with murder and I was held captive - with a death sentence over my head every single day of the 215 days I survived - until I was liberated from this living Hell at the end of the war. The conditions I endured were almost indescribably brutal and terrifying. I endured solitary confinement in a frigid, dark cage for long periods of time, broken up occasional by severe beatings and interrogations from the prison guards. Food consisted of 2 or 3 small bug infested balls of rice per day. The pain was constant, without any medical treatment of any kind. My body was covered with running sores, lice and fleas, and sleep was nearly impossible because of the bed bugs. I lost over 100 pounds and was failing rapidly, both physically and mentally. I lived on the very fringe of existence - and it was becoming exceedingly difficult to maintain the desire to live. As time went on, more of my fellow POW comrades died or were killed. It reached the point where I never thought I would survive and make it home. I prayed to God to help me live through another minute, then hour, then day. I'm not afraid to admit, I cried often in that cold dark cage. Almost miraculously, our prisoner of war camp survived a massive fire raid by B-29s on nearby Tokyo that took place on March 10,1945. Much of Tokyo burned to the ground that night, with more than 100,000 people killed, more even than those killed at either Nagasaki or Hiroshima after an atomic bomb was dropped on these two cities. The wooden stable - where I was held captive in a steel cage - was surrounded by a huge fire that night. Again, I don't know how I endured the heat or the smoke. After I survived the fire bombing, I was removed from my own cage and put on exhibit (naked) in a tiger cage at the Ueno Zoo in Tokyo, where Japanese civilians, mostly women, looked upon me in sad silence. Thankfully, I was eventually moved to the Omori POW facility. Throughout the entire ordeal, I was under a decree of capital punishment, with the uncertain knowledge that, at any given moment, I could be executed and put to death. Two weeks after the war ended, myself and my fellow POWs, those that were still alive, were liberated. That day was August 29, 1945. I remember spending two weeks aboard the hospital ship, USS Benevolence, in Tokyo Bay - I was too physically weak and unfit to travel back to the USA. I ended up spending additional months in a government hospital for returning soldiers in West Virginia, before I eventually made it home in Cincinnati. At first, I found it very difficult to "return to normal." I tried hard, but my progress was slow. Even now, I have not been one hundred percent successful in eradicating all of the bad memories, but it's so much better than it once was. As time went on, I experienced severe nightmares with varying degrees of frequency. I've made progress, and they are less frequent now. The dreams tended to be of a constant nature: falling through space and trying to reach out to hold onto something. Or being surrounded by fire and smoke and high winds - the firestorm - or working to avoid being beaten by guards with their rifle butts. Yet, as the years started to pass by, I saw and felt some positive things in my life - and I started to feel good about myself and my life - and even life in general. After initially declaring to myself that I would never - ever - go back to Japan, a gradual transition in my thinking began to take place. Perhaps if I did go back and see with my own two eyes the Japanese people after the war (versus my totally negative remembrance of them during the war), well perhaps this would be a good thing for me. Now, since my first return visit to Japan in 1984, I have been back to this wonderful country eight different times. These trips have been a great help in eradicating those bad memories. I now have many friends throughout Japan. A few years ago, I had 32 Japanese people touring the United States spend the day with me at my home in northern California. My thoughts and my mind over the last 30 plus years have demonstrated gradual changes within my heart and soul. I can state without reservation that I have experienced positive things in my life that are a direct by-product of those terrible days as an American POW in Japan. My feelings now are this - if you can go through adversities like I've described and survive, the possibility exists that one day you might actually make comparisons on events and problems in your present day life and actually appreciate how small some of the things we actually worry about really are. One can actually become more positive and appreciative of life because of earlier hardships, even the most awful of hardships. I feel these positive changes and higher values can apply to individuals in their personal life, in their family life, and in the world of business and society. As I look at myself today, I know I have a far greater appreciation of life. Yes, even the simplest of things that I formerly took for granted can take on a special meaning for me now. I appreciate that I was very fortunate to survive this experience. And I have this feeling that I should do things for others as a form of appreciation for having been so lucky - or blessed - or maybe both. I definitely have a much higher level of confidence than I've ever had before. I set higher goals and I have higher expectations of myself and I've achieved a reasonable degree of success in many of the things I've attempted to accomplish. Most importantly, I no longer sweat or stress over the small stuff. I guess I've finally taken time to stop and smell the roses. For instance, I've made significant progress in the matter of speaking before groups. Even when I was a man in my forties, I had a fear of public speaking. Hopefully my presentations, no matter how tough they were for me, have had a positive and motivating effect on my audience. Sure, we all have problems - but you don't have to give up. All of us can hang in there and solve our problems and appreciate the incredible gift of life. I make it a point to speak to students - I've probably spoken to groups of young people over 200 times now. I tell them how - within each of us -there is a power and ability to solve and accomplish things we never before thought was possible. I appreciate my life - and my freedom. And I love watching our Flag flowing in a gentle breeze. I enjoy and appreciate sunrises and sunsets - and especially the stars. Stars that I use to navigate with during long nighttime missions in a B-29 over the Pacific. The stars are still - and will always be - my friends. I guess I've come to the conclusion that it was those difficult days during WW II that taught me a lot of things about myself - things that have helped me over the many years of my life. Lessons that are still helping me today. And I will always continue to use what I've learned to help other people grow too. Especially young people, who sometimes need a little help growing. Bill, thank you for introducing me to the concept of "Post Traumatic Growth." I didn't know about this powerful new concept before, but I'm a believer in it now. One incident I always remember took place while I was hanging in my parachute after bailing out from our B-29. Suddenly, three Japanese fighter planes appeared at my level and made a close in pass. Two of them left but the third one made a large swing and headed directly for me. I feared the worst. Then the pilot of this plane saluted me and left. I couldn’t quite comprehend all this but it gave me the feeling that maybe, just maybe, there was a hope for me. After my first return visit to Japan in 1984, some of my newly acquainted friends became interested in this story and began searching this pilot. They located him and I was finally able to meet him again in October of 2000. I thanked him for his noble act of saluting me 56 years earlier. He had been confined to bed for some years. We embraced each other; we didn’t have to talk. That was a very memorable meeting. I was planning to visit him again during my most recent trip to Japan in the summer of 2004. I was in Nara the night before I was scheduled to visit him and received the news that he had died several hours before. I was invited by his son and his friends to come to pre-funeral gathering. His son offered me the opportunity to see his father for the last time. I didn’t know what the proper Japanese protocol for this kind of occasion was, but said prayers. And I retuned my salute to him after 59 years. I am extremely happy about your miraculous safe return to the U.S. and your subsequent activities. I am also deeply impressed by the way you overcame the hate and abuse while you were a prisoner of war, and how with a heart of charity you have been reaching out to your former enemy, the Japanese. I was a first grader in a national elementary school at the end of the war. It was while I was studying about the reality of these childhood recollections of B-29s that I met you. Our family saw before our very eyes the great Tokyo air raid of March 10, 1945. Although we hurriedly evacuated to my mother's parents' home, my father, who remained in Tokyo, was hurt in the air raid, and not having any medicine, died on June 30. He left behind my mother and her four children. Shortly after that, on July 15, 1945, one of the airmen shot down by the Japanese Army descended by parachute near where we were taking refuge. The military police captured him, tied his hands behind his back, blindfolded him and then paraded him around the village. I stared at this spectacle along with all the other villagers. Half a century went by, and I often wondered if the airman had lived to return to his own country. At the time, though, it was rumored that he was immediately executed. After I retired, I had the opportunity to search for some real clues and went to see the legendary B-29 crash site. A record of my research was made public on a website and I appealed to both Japan and the U.S. for more information. Some American and Japanese knowledgeable on B-29s saw my website and offered their help in my search for the truth. And it was you, Hap, who gave me information about a POW I had been looking for, who was interned with you at the Omori POW camp and liberated together on August 29, 1945. I also received an email from the nephew of the captain of the plane that was shot down, expressing his gratitude that he was able to finally find information that he had been searching for. An 82-year-old American woman, whose younger brother took part in an air raid on Kobe and became a POW and then was executed just before the war ended, sincerely told me of the importance of peace, and that she was happy there was now friendship between Japan and the U.S.
For 53 days, both you and I were under the same Tokyo sky -- when you became a POW from January 27, 1945, until the time I evacuated on March 19. Those days, not only above the skies but under as well, were a hell. We saw the end of the war -- my father had died, and you had lived in the terror of torture and death. Hap, you experienced in your body the futility, the sadness, and the hatred of war -- and you overcame. You are a true ambassador in seeking friendship and peace between Americans and Japanese. As one of the many Japanese who respects you, I placed in my living room a photograph of your beloved plane, The Rover Boys Express. Through my B-29 Recollections website, I hope to tell future generations about the futility of war. Hap, you take care of yourself. Hap Halloran remembers, "January 27, 1945 was a crucial day in my life. During the intervening years and days since that date, memories have persisted about those long ago events. 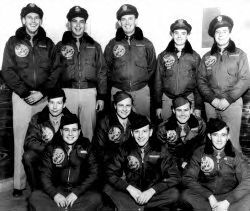 I was navigator on the Rover Boys Express B-29 crew. 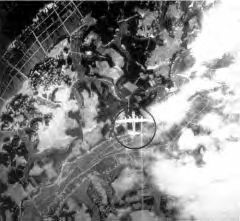 We were based on Saipan - 878th Squadron, 499th Bomb Group (VH), 73rd Wing. Our crew was flying V Square 27 that day. Our target was 357, Nakijima Aircraft Plant in Musashino on the western edge of Tokyo. Contrary to our briefing, which forecasts light flak and very little fighter opposition at our altitude, we immediately experience much fighter opposition. Flak and fighter activity intensifies as we make our turn to the east to set up our bomb run. We are on a bomb run, at an altitude of 32,000 feet, west of Tokyo. A Japanese fighter comes in from 11 o'clock high blazing away. At first it appears to be a ramming attack. Suddenly there is a tremendous explosion within the front of the plane. The "greenhouse" is severely damaged and there is damage to two engines as well. The outside air temperature of minus 58 degrees rushes in to replace the prior 50 degree Fahrenheit temperature in our pressurized plane. My best recall is that I parachuted from the critically damaged V square 27 at approximately 27,000 feet. I fell free until I opened my chute east of Tokyo at about 3,000 feet. The extreme cold at high altitude; the long free fall and shock and fear affected me physically and mentally as I hung in my chute. My landing on enemy soil was imminent. I was frightened. Then I saw three Japanese fighters several miles away at my altitude. They were heading directly at me. I feared the worst. They throttled back and circled very close to me. Two of the planes left. Hap continues, “I made a very rough landing. My hands and feet were frozen from the -58 degree temperature at high altitude and during the free fall. I am hurt. I can barely move. Civilians are forming a ring around me. They are beating me with boards and metal rods and large rocks. They are jumping on me and kicking me. I am fading in and out. Then Japanese soldiers arrived. They cut up my parachute and tied my hands and feet and blindfolded me; loaded me on a truck. I was taken to the Kempei Tai torture prison in downtown Tokyo adjacent to the Imperial Palace grounds. Severe interrogations took place before I was placed in solitary confinement in a cage. I shook from the cold and fear. My future looked bleak. We were given only one basic meal. A serving of rice about the size of a golf ball loaded with bugs - alive and dead. Generally three such servings per day were rolled into our cages. On days when B 29s or carrier planes raided Tokyo we only received two meals on that day. Silence - no talk allowed - prevailed in the wooden stable where our cages were. If we were lucky we received a cup of hot or cold water or on rare occasions a cup of tea. On a few occasions we received a small piece of black seaweed with the rice. In early April,1945 for reasons not known 32 B 29ers were moved from various holding locations in the greater Tokyo area to Omori POW camp on the southwest edge of Tokyo. What a thrill that was; to be reunited with any surviving crew members and other B 29ers. The food rations for B 29ers continued at 50% rations compared to other Allied POWs. We were never classified as POWs. We were Federal prisoners on trial for our lives, and were compelled to "sign off" on Geneva Conference rules. Food at Omori was still dirty rice (with bugs). However we occasionally received a very small serving of unidentifiable soup; and perhaps every 10 days or so we received about six fish eyes and a few fish bones - to be divided among the 32 of us. There were many difficult hours and days until that wonderful day of liberation on August 29, 1945 - two weeks after the war ended. We have much to be thankful for."